Not to be confused with Chamba State. For other uses, see Champa (disambiguation). Champa (Cham: Campa; Vietnamese: Chăm Pa) was a collection of independent Cham polities that extended across the coast of what is today central and southern Vietnam from approximately the 2nd century AD before being absorbed and annexed by Vietnamese Emperor Minh Mạng in AD 1832. The kingdom was known variously as nagara Campa (Sanskrit: नगरः चम्पः; Khmer: ចាម្ប៉ា) in the Chamic and Cambodian inscriptions, Chăm Pa in Vietnamese (Chiêm Thành in Sino-Vietnamese vocabulary) and 占城 (Zhànchéng) in Chinese records. The territory of Champa circa 1000–1100, depicted in green, lay along the coast of present-day southern Vietnam. To the north (in yellow) lay Đại Việt; to the west (in blue), Angkor. The Chams of modern Vietnam and Cambodia are the remnants of this former kingdom. They speak Chamic languages, a subfamily of Malayo-Polynesian closely related to the Malayic and Bali–Sasak languages. Champa was preceded in the region by a kingdom called Linyi (林邑, Lim Ip in Middle Chinese), or Lâm Ấp (Vietnamese), that was in existence since AD 192; although the historical relationship between Linyi and Champa is not clear. Champa reached its apogee in the 9th and 10th centuries AD. Thereafter, it began a gradual decline under pressure from Đại Việt, the Vietnamese polity centered in the region of modern Hanoi. In 1832, the Vietnamese emperor Minh Mạng annexed the remaining Cham territories. Hinduism, adopted through conflicts and conquest of territory from neighboring Funan in the 4th century AD, shaped the art and culture of the Champa kingdom for centuries, as testified by the many Cham Hindu statues and red brick temples that dotted the landscape in Cham lands. Mỹ Sơn, a former religious center, and Hội An, one of Champa's main port cities, are now World Heritage Sites. Today, many Cham people adhere to Islam, a conversion which began in the 10th century, with the Royals having fully adopted the faith by the 17th century; they are called Bani Cham (from Arabic: Bani). There are, however, Balamon Cham (from Sanskrit: Brahman) who still retain and preserve their Hindu faith, rituals, and festivals. The Balamon Cham are one of only two surviving non-Indic indigenous Hindu peoples in the world, with a culture dating back thousands of years. The other is the Balinese Hinduism of the Balinese of Indonesia. The name Champa derived from the Sanskrit word campaka (pronounced tʃaɱpaka), which refers to Magnolia champaca, a species of flowering tree known for its fragrant flowers. This Cham head of Shiva was made of electrum around 800. It decorated a kosa, or metal sleeve fitted to a liṅgam. One can recognise Shiva by the tall chignon hairstyle and by the third eye in the middle of his forehead. Modern scholarship has been guided by two competing theories in the historiography of Champa. Scholars agree that historically Champa was divided into several regions or principalities spread out from south to north along the coast of modern Vietnam and united by a common language, culture, and heritage. It is acknowledged that the historical record is not equally rich for each of the regions in every historical period. For example, in the 10th century AD, the record is richest for Indrapura; in the 12th century AD, it is richest for Vijaya; following the 15th century AD, it is richest for Panduranga. Some scholars have taken these shifts in the historical record to reflect the movement of the Cham capital from one location to another. According to such scholars, if the 10th-century record is richest for Indrapura, it is so because at that time Indrapura was the capital of Champa. Other scholars have disputed this contention, holding that Champa was never a united country, and arguing that the presence of a particularly rich historical record for a given region in a given period is no basis for claiming that the region functioned as the capital of a united Champa during that period. Through the centuries, Cham culture and society were influenced by forces emanating from Cambodia, China, Java and India amongst others. Lin Yi, a predecessor state in the region, began its existence in AD 192 as a breakaway Chinese colony. An official successfully revolted against Chinese rule in central Vietnam, and Lin Yi was founded in AD 192. 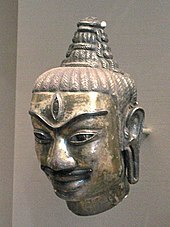 In the 4th century AD, wars with the neighbouring Kingdom of Funan in Cambodia and the acquisition of Funanese territory led to the infusion of Indian culture into Cham society. Sanskrit was adopted as a scholarly language, and Hinduism, especially Shaivism, became the state religion. From the 10th century AD onwards, Arab maritime trade in the region brought increasing Islamic cultural and religious influences. Champa came to serve as an important link in the spice trade, which stretched from the Persian Gulf to South China, and later in the Arab maritime routes in Mainland Southeast Asia as a supplier of aloe. Despite the frequent wars between Champa and Cambodia, the two countries also traded and cultural influences moved in both directions. Royal families of the two countries intermarried frequently. Champa also had close trade and cultural relations with the powerful maritime empire of Srivijaya and later with the Majapahit of the Malay Archipelago. Evidence gathered from linguistic studies around Aceh confirms that a very strong Champan cultural influence existed in Indonesia; this is indicated by the use of the Chamic language Acehnese as the main language in the coastal regions of Aceh. Linguists believe the Acehnese language, a descendant of the Proto-Chamic language, separated from the Chamicic tongue sometime in the 1st millennium AD. However, scholarly views on the precise nature of Aceh-Chamic relations vary. The people of Champa descended from seafaring settlers who reached the Southeast Asian mainland from Borneo about the time of the Sa Huỳnh culture, the predecessor of the Cham kingdom. :317 The Cham language is part of the Austronesian family. According to one study, Cham is related most closely to modern Acehnese in northern Sumatra. To the Han Chinese, the country of Champa was known as 林邑 Linyi in Mandarin and Lam Yap in Cantonese and to the Vietnamese, Lâm Ấp (which is the Sino-Vietnamese pronunciation of 林邑). It was founded in AD 192. Around the 4th century AD, Champan polities began to absorb much of Indic influences, probably through its neighbour, Funan. Hinduism was established as Champa began to create Sanskrit stone inscriptions and erect red brick Hindu temples. The first king acknowledged in the inscriptions is Bhadravarman, who reigned from AD 380 to AD 413. At Mỹ Sơn, King Bhadravarman established a linga called Bhadresvara,:324 whose name was a combination of the king's own name and that of the Hindu god of gods Shiva. The worship of the original god-king under the name Bhadresvara and other names continued through the centuries that followed. Rudravarman of Champa founded a new dynasty in 529 CE and was succeeded by his son Shambuvarman. Shambhuvarman reconstructed the temple of Bhadravarman and renamed it to Shambhu-bhadreshvara. He died in 629 and was succeeded by his son Kandarpadharma who died in 630-31. Kandarpadharma was succeeded by his son Prabhasadharma who died in 645. Between the 7th to 10th centuries AD, the Cham polities rose to become a naval power; as Champan ports attracted local and foreign traders, Champan fleets also controlled the trade in spices and silk in the South China Sea, between China, the Indonesian archipelago and India. They supplemented their income from the trade routes not only by exporting ivory and aloe, but also by engaging in piracy and raiding. However, the rising influence of Champa caught the attention of a neighbouring thalassocracy that considered Champa as a rival, the Javanese (Javaka, probably refers to Srivijaya ruler of Sumatra and Java). In AD 767, the Tonkin coast was raided by a Javanese fleet (Daba) and Kunlun pirates, Champa was subsequently assaulted by Javanese or Kunlun vessels in AD 774 and AD 787. In AD 774 an assault was launched on Po-Nagar in Nha-trang where the pirates demolished temples, while in AD 787 an assault was launched on Phang-rang. In the Cham–Vietnamese War (AD 1471), Champa suffered serious defeats at the hands of the Vietnamese, in which 120,000 people were either captured or killed, and the kingdom was reduced to a small enclave near Nha Trang with many Chams fleeing to Cambodia. Emperor Minh Mạng who annexed Kingdom of Champa to Kingdom of Vietnam in 1832. Between the 2nd and the 15th centuries AD, Champa at times included the modern provinces of Quảng Nam, Quảng Ngãi, Bình Định, Phú Yên, Khánh Hòa, Ninh Thuận, and Bình Thuận. Though Cham territory included the mountainous zones west of the coastal plain and (at times) extended into present-day Laos, for the most part, the Cham remained a seafaring people dedicated to trade, and maintained few settlements of any size away from the coast. Indrapura ("City of Indra") was the capital of Champa from about AD 875 to about AD 1000. It was located at the site of the modern village of Dong Duong, near the modern city of Da Nang. Also found in the region of Da Nang is the ancient Cham city of Singhapura ("City of the Lion"), the location of which has been identified with an archaeological site in the modern village of Trà Kiệu, and the valley of Mỹ Sơn, where a number of ruined temples and towers can still be seen. The associated port was at modern Hội An. The territory once controlled by this principality included present-day Quảng Bình, Quảng Trị, and Thừa Thiên–Huế provinces. Closeup of the inscription in Cham script on the Po Nagar stele, 965. The stele describes feats by the Champa kings. Vijaya was located in present-day Bình Định Province. Early mention is made of Vijaya in an AD1160 inscription at Po Nagar. :318 The capital has been identified with the archaeological site at Cha Ban. The associated port was at present-day Qui Nhơn. Important excavations have also been conducted at nearby Thap Mam, which may have been a religious and cultural centre. Vijaya became the political and cultural centre of Champa around AD 1000, when the northern capital of Indrapura was abandoned due to pressure from the Viet. It remained the centre of Champa until AD 1471, when it was sacked by the Viet and the centre of Champa was again displaced toward the south. In its time, the principality of Vijaya controlled much of present-day Quang-Nam, Quang-Ngai, Bình Định, and Phú Yên Provinces. Within the four principalities were two main clans: the "Dua" (means "coconut" in Vietnamese) and the "Cau" (means "areca catechu" in Vietnamese). The Dua lived in Amravati and Vijaya, while the Cau lived in Kauthara and Panduranga. The two clans differed in their customs and habits and conflicting interests led to many clashes and even war. But they usually managed to settle disagreements through intermarriage. Champa art, Hindu temples and statues have been found in many parts of Vietnam. While today the Balamon Cham are the only surviving Hindus in Vietnam, the region once hosted some of the most exquisite and vibrant Hindu cultures in the world. The entire region of Southeast Asia, in fact, was home to numerous sophisticated Hindu kingdoms. From Angkor in neighbouring Cambodia, to Java and Bali in Indonesia. 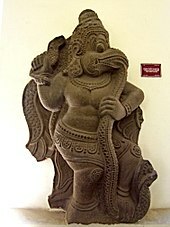 13th century sculpture in the Thap Mam style, depicting Garuda devouring a serpent. Before the conquest of Champa by the Đại Việt emperor Tran Thánh Tông in 1471, the dominant religion of the Cham people was Hinduism, and the culture was heavily influenced by that of India. The Hinduism of Champa was overwhelmingly Shaiva and it was liberally combined with elements of local religious cults such as the worship of the Earth goddess Lady Po Nagar. The main symbols of Cham Shaivism were the lingam, the mukhalinga, the jaṭāliṅgam, the segmented liṅgam, and the kośa. A liṅga (or liṅgam) is black stone pillar that serves as a representation of Shiva. Cham kings frequently erected and dedicated stone lingas as the central religious images in royal temples. The name a Cham king would give to such a linga would be a composite of the king's own name and suffix "-iśvara", which stands for Shiva. A mukhaliṅga is a linga upon which has been painted or carved an image of Shiva as a human being or a human face. A jaṭāliṅga is a linga upon which has been engraved a stylised representation of Shiva's chignon hairstyle. A segmented liṅga is a linga post divided into three sections to represent the three aspects of the Hindu godhead or trimurti: the lowest section, square in shape, represents Brahma; the middle section, octagonal in shape, represents Vishnu, and the top section, circular in shape, represents Shiva. 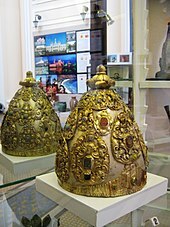 A kośa is a cylindrical basket of precious metal used to cover a linga. The donation of a kośa to the decoration of a liṅga was a distinguishing characteristic of Cham Shaivism. Cham kings gave names to special kośas in much the way that they gave names to the liṅgas themselves. The predominance of Hinduism in Cham religion was interrupted for a time in the 9th and 10th centuries AD, when a dynasty at Indrapura (modern Dong Duong, Quảng Nam Province, Vietnam) adopted Mahayana Buddhism as its faith. The Buddhist art of Dong Duong has received special acclaim for its originality. Beginning in the 10th century AD, Hinduism again became the predominant religion of Champa. Some of the sites that have yielded important works of religious art and architecture from this period are, aside from Mỹ Sơn, Khuong My, Trà Kiệu, Chanh Lo, and Thap Mam. Islam started making headway among the Cham after the 10th century AD. By the 17th century, the royal families of the Cham had converted to Islam. Most Cham are now evenly split between being followers of Islam and Hinduism, with the majority of Vietnamese Cham being Hindu while the majority of Cambodian Cham are Muslim, though significant minorities of Mahayana Buddhists continue to exist. Indonesian 15th century records indicate the influence of Princess Daravati, a Cham, converted to Islam, and influenced her husband, Kertawijaya, Majapahit's seventh ruler to convert the Majapahit royal family to Islam. The Islamic tomb of Putri Champa (Princess of Champa) can be found in Trowulan, East Java, the site of the Majapahit imperial capital. In the 15th to 17th century, Muslim Cham maintained a cordial relationship with the Aceh Sultanate through dynastic marriage. This sultanate was located on the northern tip of Sumatra and was an active promoter of the Islamic faith in the Indonesian archipelago. In contrast to Đại Việt, Champa's economy was not based on agriculture. As seafaring people, the Cham were highly mobile and established a network of trade including not only the major ports at Hội An, Thi Nai but also extending into the mountainous hinterland. Maritime trade was facilitated by a network of wells that provided fresh water to Cham and foreign ships along the coast of Champa and the islands of Cu Lao Cham and Ly Son. While Kenneth R. Hall suggests that Champa was not able to rely on taxes on trade for continuous revenue, but instead financed their rule by raiding neighbouring countries, Hardy argues that the country's prosperity was above all based on commerce. The vast majority of Champa's export products came from the mountainous hinterland, sourced from as far as Attapeu in southern Laos. They included gold and silver, slaves, animal and animal products, and precious woods. By far the most important export product was eaglewood. It was the only product mentioned in Marco Polo's brief account and similarly impressed the Arab trader Sulayman several centuries earlier. Most of it was probably taken from the Aquilaria crassna tree, just as most of the eaglewood in Vietnam today. Mỹ Sơn is the site of the largest collection of Cham ruins. Po Klaung Garai in Panduranga (Phan Rang). Po Sah Inu in Hamu Lithit (Phan Thiết). Some of the network of wells that was used to provide fresh water to Cham and foreign ships still remains. Cham wells are recognisable by their square shape. They are still in use and provide fresh water even during times of drought. Champa ladies dance at Poklong Garai stupa in Phan Rang. ^ a b c Parker, Vrndavan Brannon. "Vietnam's Champa Kingdom Marches on". Hinduism Today. Retrieved 21 November 2015. ^ "Champa, Sanskrit Dictionary for Spoken Sanskrit". spokensanskrit.org. Retrieved 16 January 2019. ^ Vickery, "Champa Revised", p.4 ff. ^ Maspero, Le royaume de Champa, represented the thesis that Champa was politically unified. Vickery, "Champa Revised", challenges that thesis. ^ Stacy Taus-Bolstad (2003). Vietnam in Pictures. Twenty-First Century Books. p. 20. ISBN 0-8225-4678-7. Retrieved 9 January 2011. ^ Paul Sidwell. "Acehnese and the Aceh-Chamic Language Family". Academia. ^ Thurgood, Graham (1999). From Ancient Cham to Modern Dialects. ISBN 9780824821319. Retrieved 28 December 2014. ^ "Champa - ancient kingdom, Indochina". ^ Stacy Taus-Bolstad (1 January 2003). Vietnam in Pictures. Twenty-First Century Books. pp. 20–. ISBN 978-0-8225-4678-8. ^ Haywood, John; Jotischky, Andrew; McGlynn, Sean (1998). Historical Atlas of the Medieval World, AD 600-1492. Barnes & Noble. p. 3.31. ISBN 978-0-7607-1976-3. ^ Ngô Vǎn Doanh, Champa, p.31. ^ Ngô Vǎn Doanh, Champa, p.38-39; Ngô Vǎn Doanh, Mỹ Sơn Relics, p.55ff. ^ Cœdès 1966, p. 77-78. ^ Lê Thành Khôi, Histoire du Vietnam, p.109. ^ SEAMEO Project in Archaeology and Fine Arts (1984). Final report: Consultative Workshop on Research on Maritime Shipping and Trade Networks in Southeast Asia, I-W7, Cisarua, West Java, Indonesia, November 20-27, 1984. SPAFA Co-ordinating Unit. p. 66. ^ David L. Snellgrove (2001). Khmer Civilization and Angkor. Orchid Press. ISBN 978-974-8304-95-3. ^ Tōyō Bunko (Japan) (1972). Memoirs of the Research Department. p. 6. Tōyō Bunko (Japan) (1972). Memoirs of the Research Department of the Toyo Bunko (the Oriental Library). Toyo Bunko. p. 6. ^ Proceedings of the Symposium on 100 Years Development of Krakatau and Its Surroundings, Jakarta, 23-27 August 1983. Indonesian Institute of Sciences. 1985. p. 8. ^ Greater India Society (1934). Journal. p. 69. ^ Ralph Bernard Smith (1979). Early South East Asia: essays in archaeology, history, and historical geography. Oxford University Press. p. 447. ^ Charles Alfred Fisher (1964). South-east Asia: a social, economic, and political geography. Methuen. p. 108. ^ Ronald Duane Renard; Mahāwitthayālai Phāyap. Walter F. Vella Fund; University of Hawaii at Manoa. Center for Asian and Pacific Studies (1986). Anuson Walter Vella. Walter F. Vella Fund, Payap University. p. 121. ^ Roof 2011, p. 1210. ^ Schliesinger 2015, p. 18. ^ "KINGDOM OF CHAMPA". Archived from the original on 3 May 2012. Retrieved 29 May 2012. ^ Rutherford, Insight Guide — Vietnam, pg. 256. ^ Hubert 2012, p. 31. ^ Ngô 2005, p. 68ff. ^ Ngô 2005, p. 69. ^ Maspéro 2002, p. 114. ^ Taylor 2007, p. 72. Hardy, Andrew David; Cucarzi, Mauro; Zolese, Patrizia (2009). Champa and the Archaeology of Mỹ Sơn (Vietnam). NUS Press. ISBN 978-9971-69-451-7. Hubert, Jean-François (8 May 2012). The Art of Champa. Parkstone International. ISBN 978-1-78042-964-9. Maspéro, Georges (1 January 2002). The Champa Kingdom: The History of an Extinct Vietnamese Culture. White Lotus Press. ISBN 978-974-7534-99-3. Ngô, Văn Doanh (2005). Mỹ Sơn Relics. Thế Giới Publishers. Wikimedia Commons has media related to Champa.